Iridoid and Furanolabdane -Type Diterpene Glycosides from Rhizomes of Eremostachys azerbaijanica Rech. f.
1Biotechnology Research Center, Tabriz University of Medical Sciences, Tabriz, Iran. Background and objectives: The rhizomes of Eremostachys azerbaijanica Rech. f.,as an indigenous plant in East Azerbaijan province of Iran, were studied for isolation and identification of possible phytoconstituents. Methods: The air- dried and ground rhizomes were extracted with n-hexane, dichloromethane (DCM) and methanol (MeOH) using a Soxhlet apparatus. The 10%, 20% and 80% MeOH in water C18 cartridge solid phase extraction products )Sep-Pak fractions( of the MeOH extract were subjected to preparative reversed- phase high performance liquid chromatography (RP-HPLC) and the isolated pure compounds were identified by one- dimensional nuclear magnetic resonance (1D-NMR) spectroscopic technique. Results: The spectroscopic data of the compounds were compared with the respective published data and the obtained results showed the presence of four pure components, 6 - Hydroxy loganin (1), Shanzhiside methyl ester (2), Eremostachiin (β-D-glucopyranosyl-(1→2)-β-D-glucopyranosyl ester of phlomisoic acid) (3) and Phlomisoside II (4), with iridoid and furano labdane- type diterpene glycoside structures. Conclusion: The occurrence of these types of chemical structures might be a confirmation to close relation and similar pharmacological and biological activities between Eremostachys and Phlomis genera. Delazar A, Sarker SD, Nahar L, Jalali SB, Modaresi M, Hamedeyazdan S, Babaei H, Javadzadeh Y, Asnaashari S, Moghadam SB. Rhizomes of Eremostachys laciniata: isolation and structure elucidation of chemical constituents and a clinical trial on inflammatory diseases. Adv Pharm Bull. 2013; 3(2): 385-393. Mozaffarian V. A dictionary of Iranian plant names. 4th ed. Tehran: Farhang Moaser, 1996. Asnaashari S, Delazar A, Asgharian P, Lotfipour F, Moghaddam SB, Afshar FH. In-vitro bioactivity and phytochemical screening of extracts from rhizomes of Eremostachys azerbaijanica rech. f. growing in Iran. Iran J Pharm Res. 2017; 16(1): 306-314. Delazar A, Asgharian P, Asnaashari S. Biological and phytochemical screening of Eremostachys azerbaijanica Rech.f. aerial parts. Jundishapur J Nat Pharm Prod. 2017; 12(S3): 1-7. Modaressi M, Delazar A, Nazemiyeh H, Fathi‐Azad F, Smith E, Rahman MM, Gibbons S, Nahar L, Sarker SD. Antibacterial iridoid glucosides from Eremostachys laciniata. Phytother Res. 2009; 23(1): 99-103. Delazar A, Asl BH, Mohammadi O, Afshar FH, Nahar L, Modarresi M, Nazemiyeh H, Sarker SD. Evaluation of analgesic activity of Eremostachys laciniata in mice. J Nat Rem. 2009; 9(1): 1-7. Khan S, Nisar M, Simjee SU, Rehman W, Khan R, Jan I, Momin D. Evaluation of micronutrients level and antinociceptive property of Eremostachys laciniata (L.) Bunge. African J Biotechnol. 2010; 9(5): 775-777. Nisar M, Khan S, Dar A, Rehman W, Khan R, Jan I. Antidepressant screening and flavonoids isolation from Eremostachys laciniata (L.) Bunge. African J Biotechnol. 2011; 10(9): 1696-1699. Said O, Khalil K, Fulder S, Azaizeh H. Ethnopharmacological survey of medicinal herbs in Israel, the Golan Heights and the West Bank region. J Ethnopharmacol. 2002; 83(3): 251-265. Eftekharsadat B, Kazem Shakouri S, Shimia M, Rahbar M, Ghojazadeh M, Reza Rashidi M, Faraji MH. Effect of E. laciniata (L.) ointment on mild and moderate Carpal Tunnel Syndrome: a double‐blind, randomized clinical trial. Phytother Res. 2011; 25(2): 290-295. Asnaashari S, Afshar FH, Ebrahimi A, Moghadam SB, Delazar A. In vitro antimalarial activity of different extracts of Eremostachys macrophylla Montbr. & Auch. Bio Impacts. 2015; 5(3): 135-140. Asgharian P, Delazar A, Vatankhah A, Javadzadeh M, Asnaashari S. In vitro bioactivity and phytochemical evaluation of extracts from aerial parts of Eremostachys macrophylla Montbr. & Auch. growing in Iran. 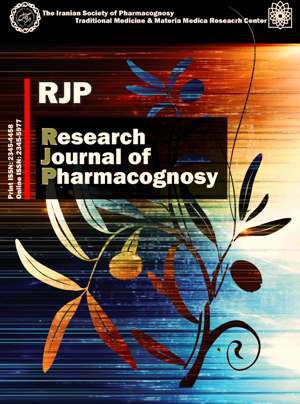 Res J Pharmacogn. 2017; 4(2): 65-73. Asgharian P, Delazar A, Lotfipour F, Asnaashari S. Bioactive Properties of Eremostachys macrophylla Montbr. & Auch. rhizomes growing in Iran. Pharm Sci. 2017; 23(3): 238-243. Delazar A, Shoeb M, Kumarasamy Y, Byres M, Nahar L, Modarresi M, Sarker SD. Two bioactive ferulic acid derivatives from Eremostachys glabra. Daru J Pharm Sci. 2004; 12(2): 49-53. Calis I, Güvenc A, Armagan M, Koyuncu M, Gotfredsen CH, Jensen SR. Secondary metabolites from Eremostachys laciniata. Nat Prod Commun. 2008; 3(2): 117-124. Delazar A, Modarresi M, Shoeb M, Nahar L, Reid RG, Kumarasamy Y, Majinda RR, Sarker SD. Eremostachiin: a new furanolabdane diterpene glycoside from Eremostachys glabra. Nat Prod Res. 2006; 20(2): 167-172. Delazar A, Byres M, Gibbons S, Kumarasamy Y, Modarresi M, Nahar L, Shoeb M, Sarker SD. Iridoid Glycosides from Eremostachys glabra. J Nat Prod. 2004; 67(9): 1584-1587. Mughal UR, Fareed G, Zubair A, Malik A, Versiani MA, Afza N, Tareen RB. Loasins A and B, new flavonoids from Eremostachys loasifolia. Nat Prod Res. 2013; 27(20): 1906-1910. Mughal UR, Fatima I, Malik A, Bakhsh Tareen R. Loasifolin, a new flavonoid from Eremostachys loasifolia: note. J Asian Nat Prod Res. 2010; 12(4): 328-330. Imran M, Mehmood R, Mughal UR, Ali B, Malik A. Vicarin, a new isoflavone from Eremostachys vicaryi. J Asian Nat Prod Res. 2012; 14(3): 293-296. Calıs I, GüvenÅb A, Armaganc M, Koyuncub M, Gotfredsend CH, Jensend SR. Iridoid glucosides from Eremostachys moluccelloides Bunge. Helv Chim Acta. 2007; 90(8): 1461-1466. Modarresi M, Foladnia M, Rafiee Z, Jafari A, Zarzasangan K. Iridoid glycosides from Eremostachys azerbaijanica Rech. f. Root. J Med Plants. 2013; 2(46): 66-77. Fouladnia M, Modarresi M. Phenylethanoid glycosides from Eremostachys azerbaijanica Rech. F. Res Pharm Sci. 2012; 7(5): 760. Asnaashari S, Afshar FH, Ebrahimi A, Moghadam SB, Delazar A. Chemical composition and radical scavenging activity of essential oil and methanolic extract of Eremostachys azerbaijanica Rech. f. from Iran. Res Pharm Sci. 2016; 11(2): 113-119. Boros CA, Stermitz FR. Iridoids. An updated review, part II. J Nat Prod. 1991; 54(5): 1173-1246. Katagiri M, Ohtani K, Kasai R, Yamasaki K, Yang CR, Tanaka O. Diterpenoid glycosyl esters from Phlomis younghusbandii and P. medicinalis roots. Phytochemistry. 1994; 35(2): 439-442. Abdel-Sattar E, El-Askary H, El-Mekkawy S. Iridoid, phenylethanoid and diterpene glycosides from Eremostachys laciniata. Bull Fac Pharm Cairo Univ. 2006; 44(3): 135-142. Kasai R, Katagiri M, Ohtani K, Yamasaki K, Chong-Ren Y, Tanaka O. Iridoid glycosides from Phlomis younghusbandii roots. Phytochemistry. 1994; 36(4): 967-970. Zhao B, Liang H, Yu Y, Dong X. A new furanolabdane diterpene glycoside from Phlomis younghusbandii Mukerjee. Acta Pharm Sin. 2009; 44(1): 60-62. Wang QS, Yang L, Cui WY, Chen L, Jiang YH. Anti-inflammatory and anti-nociceptive activities of methanol extract from aerial part of Phlomis younghusbandii Mukerjee. PLoS One. 2014; 9(3): 1-7. Dinda B, Debnath S, Harigaya Y. Naturally occurring secoiridoids and bioactivity of naturally occurring iridoids and secoiridoids. A review, part 2. Chem Pharm Bull. 2007; 55(5): 689-728. Dinda B, Chowdhury DR, Mohanta BC. Naturally occurring iridoids, secoiridoids and their bioactivity. An updated review, part 3. Chem Pharm Bull.2009; 57(8): 765-796. Dinda B, Debnath S, Bank R. Naturally occurring iridoids, secoiridoids. An updated review, part 4. Chem Pharm Bull. 2011; 59(7): 803-833.